Then America meets Prince Maxon. Gradually, she starts to question all the plans she's made for herself--and realizes that the life she's always dreamed of may not compare to a future she never imagined. Yes I said before that I was done with love triangle because I just cannot deal with the heart broken (the guy I'm rooting for is not getting the girl =/ ). But the synopsis of this book is so tempting and look at that gorgeous cover how could I resist it. Yeah screw it, I read it anyway. I just don't want to miss a good book just because I'm scared of the heart broken. 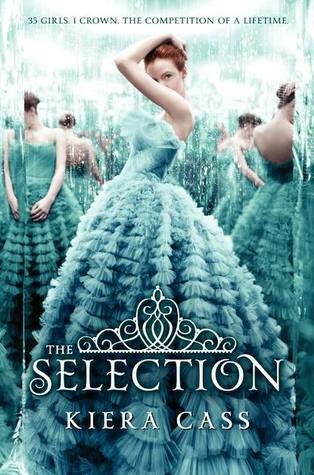 I am so glad that I read it because the Selection blew my mind. The first few pages I was confused because of the new world and the caste system. But you don't have to worry because you will have the explanation in the next chapter or you can check it here first before you start reading. And rest assured that it's not a spoiler but a little guide of the caste, what it is and what type of people belong to what caste. I love America, she is smart and just so likable. At the beginning I was all Aspen, I didn't care who Maxon is or if he would love America more or whatever. America was for Aspen, they loved each other. Some people may think Aspen doesn't love Amer but he does, really. His actions are for Amer's benefit, he loves her so much that he let her go. Besides Aspen is a great guy, he takes care of his family and never complains. So when they broke up, I felt so bad for both of them. Then Amer moved in to the palace and Maxon is always there for her and not to mention he is funny too. My heart began to move to Maxon. I know Aspen is good but look at it this way, Amer and Aspen had a chance together but it's off now, the page has turned. So now is Maxon's chance and I am officially Team Maxon. He is nice and I totally understand that he just want to be loved so how can you turn down a guy like that. Amer and Maxon is perfect together. Amer's feeling had changed too did you guy see it? She does and still loves Aspen but she is not in love with Aspen. Here's the list of all the 35 girls so you won't get lost because it is a lot of them. I'm in the middle of reading this and its so good! I hope the ending is as good as the rest is so far! !